Hello and Welcome to another Stamp Review Crew Blog Hop! Today we're doing things a little differently. Usually a Stamp Review Crew hop features just one chosen stamp set, but for today's hop we are featuring any of the 2016 Sale-A-Bration stamp sets! So there is lots of inspiration to see! If you're hopping in, then you just came from the Talented Tanya Boser's Blog. If you're just joining me, No problem! Simply start here and go all the way around using the buttons below! 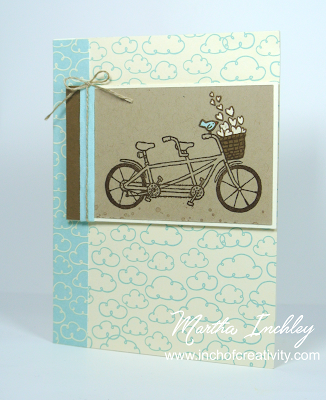 Today I'm excited to be sharing the Sale-A-Bration stamp set: Pedal Pusher! If you don't recognize this one, don't worry! You haven't missed out! This Sale-A-Bration stamp set is available starting tomorrow (Feb 16th). Today I have paired the Pedal Pusher stamp set with the Sweet Lil'Things DSP. My colour combo is: Very Vanilla, Crumb Cake, Soft Suede and Pool Party. Along with the Pedal Pusher stamp set, I also used the "Gorgeous Grunge" stamp set, to add some texture below the bike. To embellish my card, I used the Pool Party 1/4" Cotton Ribbon, Linen Thread and the new and FABULOUS Wink of Stella Glitter Brush! It's hard to see in my pictures but I added Glitter to the hearts. To get my bird, the hearts and the basket to stand out, I stamped them on coloured cardstock, fussy cut them out and glued them on top. I like fussy cutting, but I must admit, those last few hearts were challenging! So... What do you think? For some reason this doesn't feel like a typical Martha card to me, which is okay. I was trying to do something different then usual... you know... like not automatically reaching for the whisper white card stock... Anyone else guilty of that? Anyways... before I send you off to the next blog, I thought I'd share one more little inspiration with you. While I was working on my card, my 5 year old son came in and wanted to craft with me. 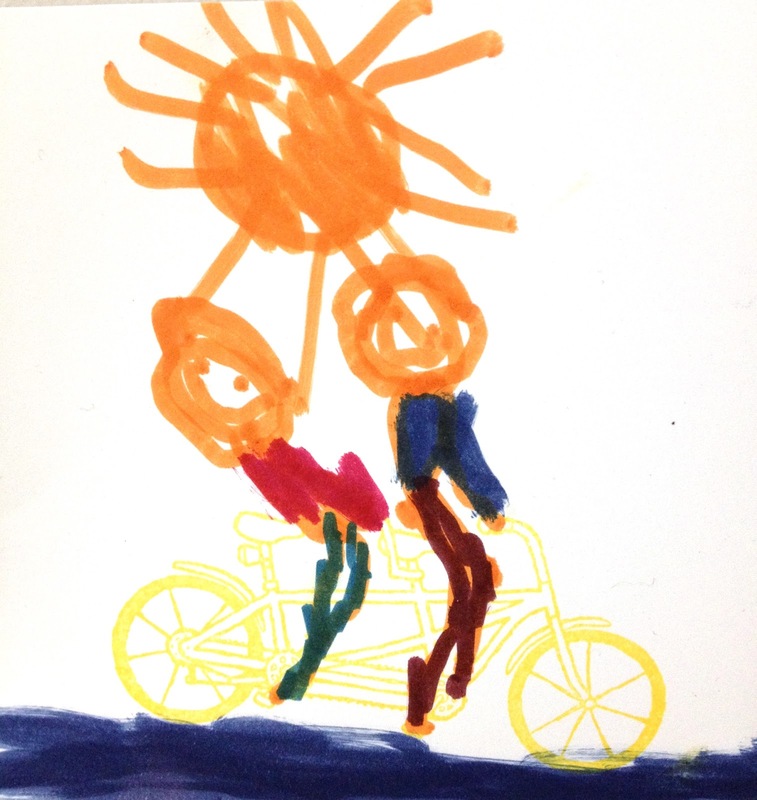 Of course he wanted to use the bike too and here is what he created. How cute is that!?! That's mommy and daddy riding the bike. Yep! He beat me on the cuteness level! Well, Thanks for hopping in, Next up is the Talented JessicaWilliams! Enjoy the rest of the hop! This is so sweet, Martha! I love the colors and you fussy cutting was so worth it! 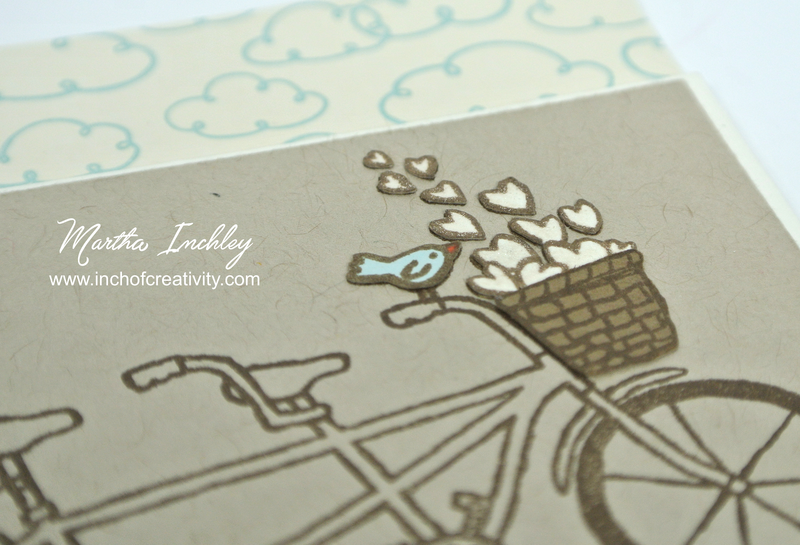 What a cute card you created with the new stamp set! I love it paired with the paper you used. And your son's is adorable too! a definite "must have" stamp set; your card's nice; TFS! Just gorgeous Martha! I love this sample and am itching to get my hands on this set. Super cute job by your son too! They are so precious. Lovely! The background paper is the perfect complement. Such a sweet card. Love the colors you chose and the paper piecing. Of course, the card your son made is SUPER cute. Love his happy colors!